Nine years ago, my beautiful wife and I traveled to Paris. For the first time since then, I am in Paris again. This is a bittersweet time, and I am glad to have my daughter Andi, and son-in-law Jason with me. I couldn’t do it without them. Several of my fondest memories of being in Paris with her are detailed in the book Thirteen Months. Today I will post one that didn’t make it to the book. It was thought to be too sensitive in nature. Tell me what you think. Paris is an amazingly romantic place. The moment we arrived, we walked for miles along the Seine River. Many Parisians wandered about on that sunny Sunday afternoon—the weather was perfect. 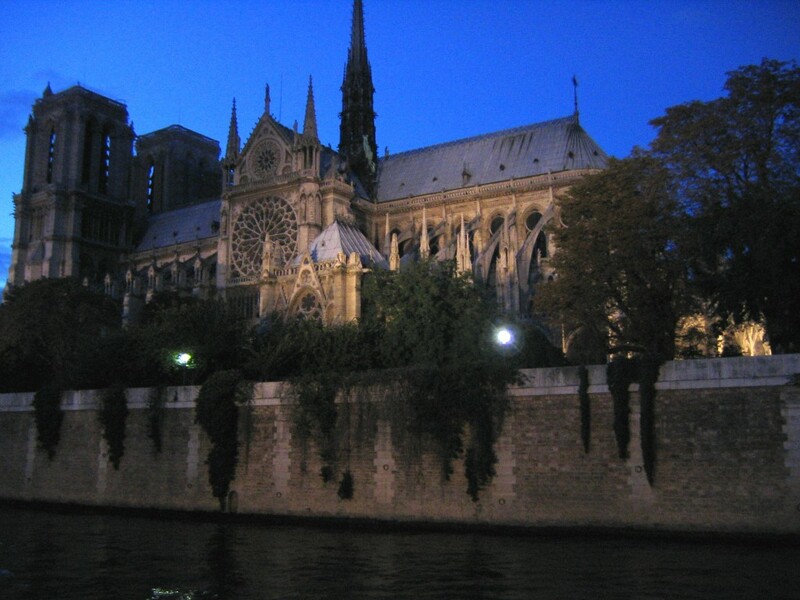 We made our way along the river to Notre Dame Cathedral. Majestically, it towered above the village streets lined with shops and tiny eateries. It took us a moment to absorb the incredible culture. Even the entrance was filled with stone statues and carved likenesses of the patron saints. Inside the cathedral, the art and furnishings were absolutely spellbinding. The history contained within those walls is awe-inspiring. The sun was beginning to set as we walked outside and wandered through the grounds. Perhaps we took a liberty or two, entering through gates that weren’t quite locked and ignoring warning signs posted in the grass. But once inside the garden area, it was too late … and way too romantic to leave. We sat on a bench with the river beside us, surrounded by lush trees and flowers as the sun slowly set behind the cathedral. Beams of sunlight stretched across the grounds, striking the flowers with the last brilliant moments of color for the day. Before long we were lost in each other’s arms, and nothing else mattered. Her eyes glistened and she looked straight into my heart—a memory I will never forget. I saw in her eyes that day something I have seen a million times during our marriage. It was a look that said, ‘I love you more than anything in this world, you are the love of my life and there is no man in my heart but you.’ I was unable to resist her—she had stolen my heart. The moment progressed to become, shall we say—romantic? But the wonderful sweetness was abruptly interrupted. Without warning, three priests sauntered through an enormous door that looked so big it would take all three of them to open. They stopped and stared at us, astonished that we would enter their forbidden territory. It’s important to note that we did not climb a barbed wire fence or scale walls to get there—we simply walked in. You might say it beckoned us. There was no doubt among these men—they didn’t want us there. For a moment, they sized us up as if they were trying to decide if they could take us. Suddenly, the Priest in charge spoke to us in strong terms—in French, of course. I was standing at that point, and when I looked down at Gwen still sitting on the bench, she was giggling hysterically. Her entire body shook, and she put her hand over her mouth as if they wouldn’t know she was laughing. I looked back at the three-man trio, and the gentleman said it again … or … something again. I mean … it was in French so who knows. Now I had the new problem of an impending battle with what we will refer to as “The Priests,” and I was no longer in control, thanks to Gwen who was jiggling and giggling beside me. I stood firm and began to posture myself. I had to defend my bride, right? But what should appear in the doorway? Nuns–Yes, nuns. Two things I’ve learned from life—you cannot fight a Priest (it’s not proper) and you can’t outrun a Nun (it’s not possible). When our fate appeared to be sealed, Gwen stood to her feet, politely apologized (in English) and gave these gentlemen the dimple. I promise you, that all three men smiled at her as the nuns in the doorway scowled with contempt. On our way out, we stopped on the bridge crossing the river. We hugged and laughed, and thanked God for the moment. It was the perfect beginning of a wonderful week.